3. 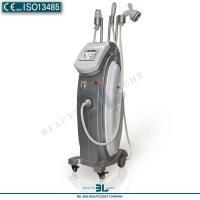 Vacuum and rf fat kneading and burining: speed up metabolizing the dissolved fatty acid and glycerol. Carry out three different ways of treatment to the subcutaneous fatty tissue, so that the gathered lipocyte could disassemble into metabolizable fatty acid and glycerol quickly, which could be taken away by the body fluid after penetrating the epicyte, and then the rapid body slimming is realized. The three functions are carried out simultaneously in order to make the body slimming get instant result, not only to lose weight but also to reduce size. Fat reduction and body contouring, tightening the muscles of arm, crus, thigh, buttocks, waist and abdomen. Body reshaped. Ease the pain ( sush as arthralgia, sciatica). Do mechanical aerobic exercise to the skin tissure regularly. Pressure and fatigue prompt relief. Stimulates the collagen and promotes the skin's metabolism, then the metabolic waste in the body tissue will be removed by the deep and powerful lymph therefore offers the lymphatic drainage throughout the body. 1. All the handpieces support plug and play. They could be identified automatically by the system and led to the corresponding working screen. Celluliting, fat burning and kneading at the same time. Losing weight, reducing size and contouring at the same time to have a perfect effect. Obligate technical connector to make the system update easily. Modulized design for the power is suitable for import and export as well as maintenance. Three handpieces with strong functions support plug and play. The technology of controllable CPU password to make it free to set the service life and convenient to rent and sell. 8.4 inch colored screen, touchable design, easy to work with.